Before I met my husband, my version of dirt track racing was the demolition derby and crazy 8 races at one of the nearby fair grounds. I had gone to those a few times with my mom, step dad, and siblings. My husband, on the other hand, grew up going to the dirt track races with his family. His dad raced from the early 70’s to about 1995. My husband, having grown up on the dirt rack, I suppose you could say the passion is in his blood. When I first started going to the races with him and his family, I wasn’t all that interested in what was happening. There is a lot to learn and even now, 7 years later, I am still full of questions. However, I went for him. I knew it was what he enjoyed and, honestly, it is like a family tradition of his. We have spent many weekends on the different dirt tracks. We have seen many different types of cars; sprint cars, modifieds, late models, hobby stocks, hornet class, modified lights (dwarf cars), and pro-am/stock cars. I personally like the sprint cars the best. 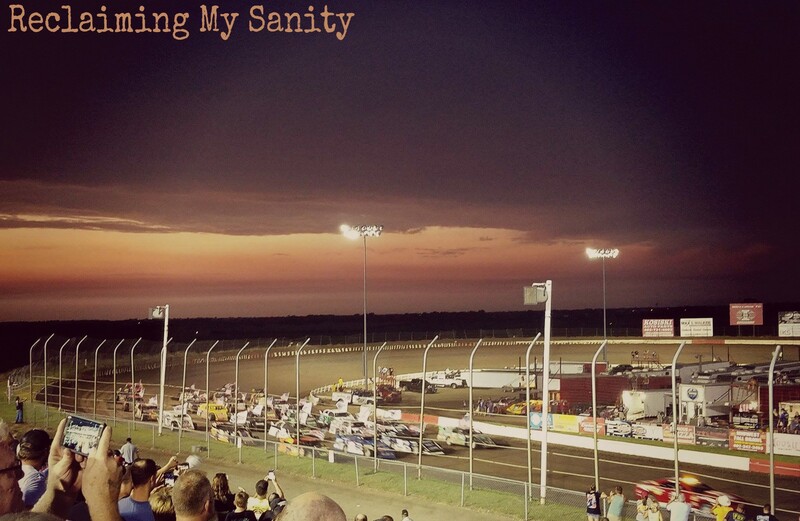 For me, the dirt track is more than just a dirt track. It is upholding the traditions of my husband’s family. Though, I do have more of an interest of what’s actually going on now than I did when we first met. It’s spending that quality time with his parents, doing something they have been doing for many, many, years. It is bringing our children and carrying the traditions on to them. I know, for certain, if money was not an object, my husband would be on the track racing his heart out. Maybe some day in the future we will be able to make that happen. I would love to see him live out that dream. The dirt track has become a part of my life. It has become part of the traditions that our kids will remember. I think it is important to carry on traditions. Besides, who would pass up a free dirt facial? Here are a couple of pictures of dirt tracks my husband took. What traditions do you have as a family? What traditions of your partner’s have you implemented, or carried on, into your family? Let me know in the comments! Pingback: An interesting observation from the wife of a dedicated race fan. – Dirt Track 101: How to get started in entry level dirt track racing.